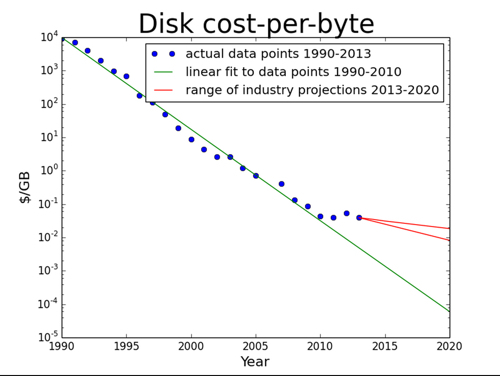 Analysis Kryder's Law says disk storage will keep on getting cheaper. Yet it is increasingly looking like it won't, which has baleful implications for cloud storage and archiving. Like Moore's Law, Kryder's Law is (a) not a law, merely a wonderfully apt observation for a prolonged but not eternal period of time, and (b) borne of an incredibly bold and confident view of technology. Mark Kryder was a Seagate SVP for research and its chief technology officer when an article titled Kryder's Law – where he was interviewed – appeared in a 2005 issue of Scientific American. The "Law" declares that disk drive areal density would more than double every two years, meaning disk drive capacity would do likewise. Since the introduction of the disk drive in 1956, the density of information it can record has swelled from a paltry 2,000 bits to 100 billion bits (gigabits), all crowded in the small space of a square inch. That represents a 50-million-fold increase. The SA article got it spectacularly wrong about small hard drives replacing flash drives when it said: "Soon hard drives will migrate into phones, still cameras, PDAs, cars and everyday appliances," and replace flash drives. Exactly the reverse happened. Kryder wrote in a 2009 PhysOrg.com article (a précis can be found here) that, by 2020, a 2.5-inch, 2-platter drive would store more than 40TB of data. Currently 2.5-inch drives are at 500GB/platter with some at 600GB or even 667GB/platter – a long way from 20TB/platter. To reach 20TB by 2020, the 500GB/platter drives will have to increase areal density 44 times in six years. It isn't going to happen. What has happened is that it is getting progressively more difficult and much more expensive to keep on cramming bits onto disk platters. Kryder's Law is "slowing down", so to speak. David Rosenthal is an engineer who worked with James Gosling at Carnegie-Mellon University on the interface in the Andrew Project, moving on to operating systems' windowing interfaces with Gosling at Sun. He then moved to Nvidia, as employee number 4, to work on graphics chip. His DSHR blog focuses on long-term data storage. After more than a quarter century of Kryder's Law, the exponential increase in disk capacity at constant form factor, and thus exponential decrease in $/GB, almost everyone believed that long-term storage was effectively free. 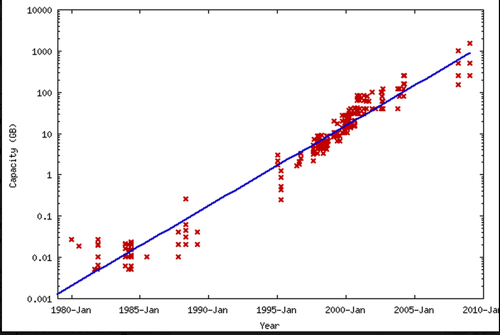 Kryder's Law: disk capacity increase trend 1980 - 2010. Source David Rosenthal. The assumption was that: "If you could afford to store some data for a few years, you could afford to store it forever. The cost of that much storage would have become negligible." Only that is no longer true. Rosenthal discusses "the Kryder rate (the annual percentage drop in $/GB)" and says it is slowing, citing a graph from Preeti Gupta at UCSC in support. Kryder slowdown. Chart by Preeti Gupta at UCSC. This graph "shows that disk is now about seven times as expensive as it would have been had the industry maintained its pre-2010 Kryder rate."